If you are searching for answers on wiring lights in series, unless you are doing an experiment for a science project on electrical theory, you are most likely not using the correct terminology. Wiring lights in series is not something that is done in normal practice, especially in home wiring. If you are not looking for information about wiring lights in series, but rather wiring a series of lights together on one circuit, the way the lights are connected is a parallel arrangement, and not series. Wiring lights in series results in the supply or source voltage being divided up among all the connected lights with the total voltage across the entire circuit being equal to the supply voltage. For many reasons, in practice this type of series connection is not done. Varying degree of lumen output from the connected lights, all below the intended rating of the fixture, and the fact that if one light burns out, the entire circuit quits working are among the most obvious reasons why. So with the exception of rare circumstances, wiring lights in series is not done, and the connection is a parallel circuit. Each fixture is connected to the hot conductor and the neutral conductor so that each fixture has the source voltage present. One example of wiring lights in series was some Christmas light strings that used to be fairly common. Again, the major negative drawback to these was when one bulb failed, the entire string quit working. Short of checking each bulb with an ohm meter, the way of solving this was the tedious exercise of replacing each bulb, one at a time with a known good bulb until the string lit up again. So the next time you hear someone discussing wiring lights in series, they most likely mean that they are wiring a series of lights, but connecting them in parallel. 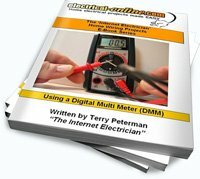 This entry was posted in Electrical Wiring, Q & A and tagged circuit, electrical, electrical circuit, electrical wiring, wiring, wiring circuit, wiring diagram, wiring lights in a parallel circuit, wiring lights in a series, wiring lights in series. Bookmark the permalink.